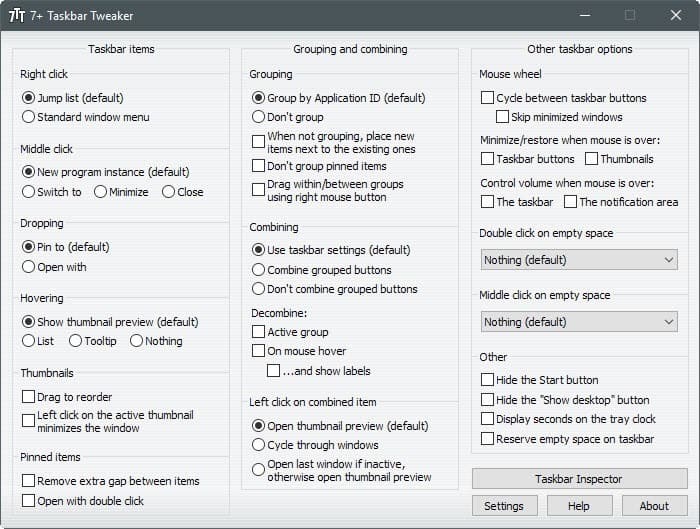 7+ Taskbar Tweaker, formerly known as 7 Taskbar Tweaker, is a free program for Windows to customize the taskbar functionality. One of the most prominent features of Microsoft's new operating system Windows 7 is the taskbar with its new functionality. The new features of it include the ability to pin programs to the taskbar, display thumbnail previews of open windows and tabs (for example from Windows Explorer, Internet Explorer or the latest version of the Firefox web browser) and jumplists that offer quick links to application specific features. The free software program Windows 7 Taskbar Tweaker is a portable application for the Windows 7 operating system. It can be used to modify several of the default options of the Windows 7 taskbar to speed up Windows 7, and to improve your work flow when you are using the system. Change left-click on grouped item button from opening the thumbnail preview to cycling through the windows. The new settings become available after clicking on the apply button in the program window. The software program is available for download at the developer's website for both 32-bit and 64-bit editions of the Windows 7 operating system. Update: The latest version of the program supports Windows 8 and 10 operating systems as well now. Middle-click on icon in taskbar: open new program instance, switch to the program, minimize or close. Thumbnails: Drag to reorder, and left-click on the active thumbnail minimizes the window. Pinned items: Remove extra gap between items and open with double-click. Grouping: When grouping is deactivated, place new items next to existing ones, don't group pinned items and drag within and between groups using right mouse button. Dropping: pin to or open with. Combining: Use taskbar settings or combine grouped items or don't combine grouped items. Decombine: Active group, on mouse over, and show labels. Left-click on combined item: open thumbnail preview or cycle through windows or open last window if inactive, otherwise open thumbnail preview. Other: Reserve empty space on taskbar, hide the show desktop button. The author of 7+ Taskbar Tweaker created a short demo video that highlights some of the functionality of the program. 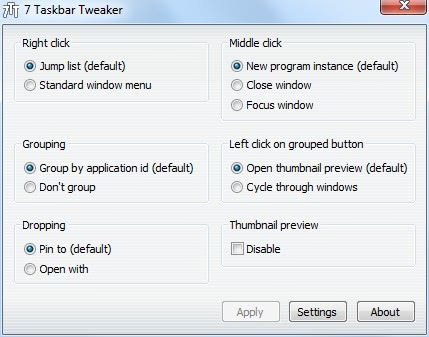 7+ Taskbar Tweaker is a handy program for Windows 7, 8 and 10 that provides you with plenty of options to customize the functionality of the operating system's taskbar. While you may not need all of them, you may find some useful enough to run the program and modify those settings. I have been using this for a few days. Functionally its similar to Taskbar Overlord, but unlike Overlord, it is a proper UI.